This was the first Elvis Presley movie I saw, and it remains my favorite of his films that I’ve seen. Part of that is because it is not a colorful cheesy musical. It is black and white, and serious, and shows that Elvis can do more than just sing. He really can act when given a good script and a good director (Michael Curtiz, in this instance). 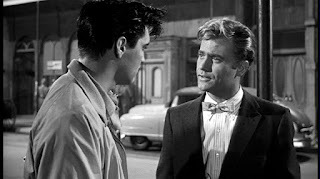 Elvis’s character is a singer, so the songs performed in this movie are performed as part of the plot, which works really well. 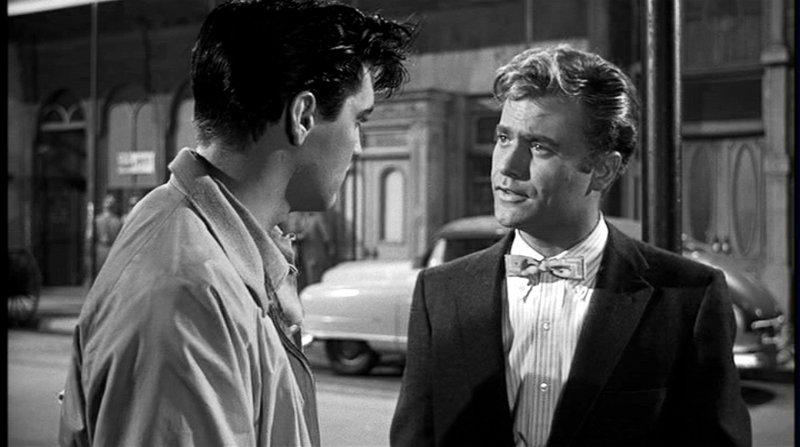 Danny Fisher (Elvis) lives in New Orleans with his sister and widowed father (Dean Jagger). His dad can’t hold down a job, so Danny and his sister both work to pay the rent, etc. Danny’s hoping to graduate high school after already being held back a year, but his school teacher flunks him for attitude, and he decides school is not for him. Danny’s jobs include bussing tables at a joint owned by Maxie Fields, the local crime boss who runs just about everything around. Maxie’s played by Walter Matthau, and he is delightfully slimy and vicious and powerful. If he can’t get what he wants by intimidation, he uses blackmail, or any other tool at his disposal to bring everyone and everything to heel. Playing against type, Paul Stewart is Charlie, the owner of a rival nightclub, the King Creole. I’m used to Paul Stewart playing gangsters and hoods, and I love that here, he’s a good guy. Honest and fair. He hires Danny to sing in his club, and the act is a sensation as, of course, Elvis does his magic whenever he performs. Maxie can’t handle this, and tries to steal Danny away. When Danny won’t play ball, Maxie uses vile and violent tactics to implicate Danny in a crime, and then blackmails him with it. Things boil to an inevitable showdown between Danny and Maxie. Along the way, there are two women who play big roles in Danny’s life throughout the movie: Ronnie (a fantastic Carolyn Jones), and Nellie (Dolores Hart). The women could not be more opposite. Ronnie is Maxie’s “girlfriend,” held to him by some unknown blackmail from the past that keeps her obedient to him. She spends most of her time drunk to numb her life. Danny brings a spark of freedom and rebellion to her life, and when he stands up to Maxie, she’s finally able to find the strength to do the same thing and break free of his control over her. She is a sort of femme fatale, except that she’s too much a victim herself. Nellie is a young woman working at a Five and Dime store who falls for Danny the first moment she sees him and she actively pursues him with dreams of a happily ever after with him. One of the things I like about this movie is that the relationships in this movie are slightly unusual. Danny and Ronnie are attracted to each other, but a lot of that is because they’re both victims of Maxie’s schemes, they both have hard lives behind them, and both dream of futures that aren’t sordid and full of crime. Both are singers. Ronnie’s singing is in her past, Danny’s is in the future. Danny rescues Ronnie, and Ronnie rescues Danny. They share a bond. They are kindred spirits. One of my favorite moments of the movie is seeing Ronnie at the end of the movie wearing casual comfortable clothes instead of the tight gowns Maxie has her wear, relaxed and natural and happy for the first time since we've met her. Nellie is the good girl, yet she pursues Danny almost desperately, pushing for a relationship that will lead to marriage. She’s young and Danny’s young, and one of the things I like is that Danny realizes at the end that he’s not ready for any kind of commitment, that he needs to find himself first. Nellie tells him she’ll wait, so hopefully she’s learned something along the way too. There’s a third romantic relationship in the film, between Paul Stewart’s Charlie, and Danny’s sister, Mimi. This one is also interesting because Charlie is twenty years older than Mimi, and says so outright. They have the most normal and supportive relationship in the film. So, what about Vic Morrow? He has a small but pivotal role as Shark, a local hoodlum with aspirations of being a big hoodlum someday. He’s got his own little gang, and he continually pushes Maxie to let him work for him. He gets his wish and becomes Maxie’s errand boy and muscle, which delights him no end. He takes great pride in obtaining this position. He’s also a smart cookie. He’s the one who figures out the best way to blackmail Danny, and Maxie lets him run with the plan, pleased with his initiative. He’s never less than polite, soft-spoken, his words phrased almost gently even when he’s threatening someone. He’s deferential to Maxie, almost to a fault. He thinks he’s a sharp dresser. He’s clearly trying to stay a classy hoodlum. And I find it interesting how he quickly he reacts to people's actions. Early on, Danny gets the drop on him and wins his respect by being faster and stronger than he is. Shark invites him to join his gang on the spot. When Danny doesn’t allow Shark to cheat one of the other members of the gang out of their earnings, Shark promptly drops him from the group. There’s a hundred ways this character could have been played. Vic’s played some very nasty characters in his career, and while Shark is a bad guy, he’s got such a pleasant, smiling façade, it amuses me no end. He and Danny finally come to a physical confrontation, a tense knife fight. It's quite something to watch Vic squaring off with Elvis. The black and white cinematography lends itself well to this movie, giving it that edge of noir feeling, and really, this is a noir movie. There is some great shots filmed on-location in New Orleans. It's moody and atmospheric, which suits the story. Elvis nails the character of Danny, and he's supported by a fabulous cast. My favorite musical numbers are "Trouble" and the last song of the movie "As Long as I Have You." Both work great within the plot. "Trouble" is the song Danny performs when ordered to sing by Maxie, who is trying to prove Ronnie and Danny are liars, that Danny can't sing. Danny's hopping mad and not only accepts the challenge, but directs the song straight at Maxie without backing down at all. Ronnie's little smile of triumph is one of her first steps to breaking free of Maxie's control. It's one of my favorite scenes. And the latter song closes the movie. It ties everything up so nicely. It's the song Ronnie says was her theme song, so Danny singing it as a tribute to her is lovely, but it also represents his return to honest life, with his whole family there to reconcile and move on with their lives, out of Maxie's sleazy shadow. 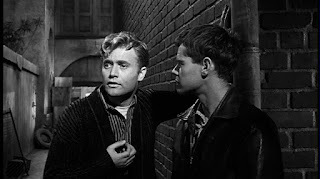 This has been my contribution to the A Tribute to Vic Morrow Blogathon. Hi there - it's time for the Tribute to Vic Morrow blogathon. This will be running through Sunday. Leave a comment either on this post or over at my co-host's site, Hamlette's Soliloquy, with the link to your contribution when you've got it posted. Thanks for joining us! Eva, from Coffee, from Classics, & Craziness: My Top Five Favorite Saunders-centric Episodes of Combat! I've never been a fan of Macbeth. It was a play I read in school (more than once, if I recall), one I saw performed live... but it never spoke or appealed to me. I never liked the characters (except for Banquo), never felt any sense of tragedy, just that they were horrible people who got what the deserved and good riddance. That changed when I saw the 2015 version just last year. 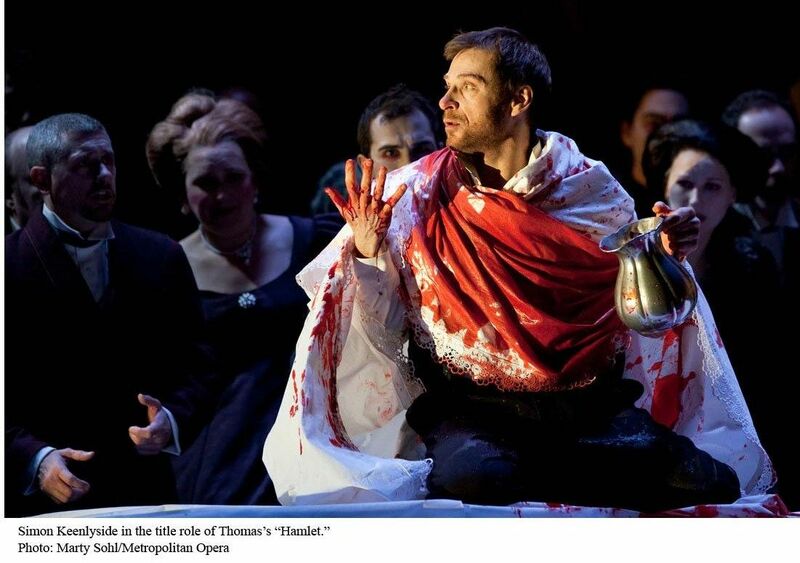 This was the first and, to this date, only version where I could relate to Macbeth, and even to Lady Macbeth. For the first time, I understood them and what drove them along their fateful, bloody path. For the first time, it actually felt like a tragedy. I liked this version well enough to buy my own copy on DVD so I can rewatch it. It's one that gets better with repeat viewings, as I pick up on more of the subtle things they do in this one. This is an atmospheric stylized Macbeth. The score drones on and on, but it does work within the context of the film. The movie was filmed in England and Scotland, and it looks fantastic. Some parts reminded me visually of Valhalla Rising (2009). What I like about this film is precisely what some fans may dislike about it: the Macbeths are not shown as such over-the-top flat-out evil and ambitious characters. Both are given more human reasons for their actions, and as each act of violence steers them farther down a path they cannot return from, you see the toll it takes on them until they are destroyed by their own overwhelming sense of guilt as much as anything else. The movie opens with a scene that is not in the play (though it could be extrapolated from Lady Macbeth's dialogue later), namely, the funeral of their young son. This serves several purposes and for this version of the play, is essential. It instantly gives both characters a great loss to overcome, and one that shadows both of them throughout the play. Particularly Lady Macbeth, who reacts badly to the death of the Macduffs and, as her own complicity and guilt wrack her, she sees images of her lost child. You get the immediate sense that had the child lived, things would have gone very differently. But no, he died, and they are a bereft and childless couple who have nothing but their service, and little reward for that. Even so, Macbeth faithfully carries out the king's orders in a battle in the beginning. The King has sent him a bunch of boys to augment his army, and Macbeth reacts to their youth and inexperience with a great sadness, though he carries out his orders. He and the older soldiers touchingly arm the younger ones for the coming battle. He bonds with one of the young men, clearly seeing him almost as the son he might have had. When the young man is killed in battle, it's a second blow, almost as devastating as the loss of his biological son. This Macbeth is weary, ravaged by battle and death, but faithful to the king. Until, of course, the witches deliver their prophecies. There are only four of them here, and most of supernatural stuff is removed. I like that about this version. Macbeth makes the mistake of sending his wife a letter about the witches' prophecies, and that is, of course, when things begin to go south for the pair. With her son taken from her, you really get the sense that she is sick of being beaten down by life, that she has nothing left to lose, that she's ready to seize whatever opportunity comes along to better their lives. Power cannot substitute for life, but it is still a powerful drug. With the witches' prophecy already half proved true, why not grab the crown? I've always loved that Macbeth still tries to back out at this point. This Macbeth knows full well it's wrong. Without Lady Macbeth to push him, again, things could have turned out differently. And who knows, he still might have ended up as king, rightfully, without the murders. The movie uses the dead son and the killed boy to represent what each Macbeth craved and lost. Lady Macbeth's famous speech is delivered to her dead son. Macbeth repeatedly sees the young man who was killed in battle at important moments. I liked those elements a lot. They ground it and are quite effective at maintaining the focus. The cast suits this version very well. Michael Fassbender (Macbeth) and Marion Cotillard (Lady Macbeth) are excellent. They are both far more sympathetic than the play's usual version of the characters. It's a joy to watch them in this movie. Macbeth descends rapidly into his own guilt-ridden madness, each act of violence pushing him further from his initial humanity. 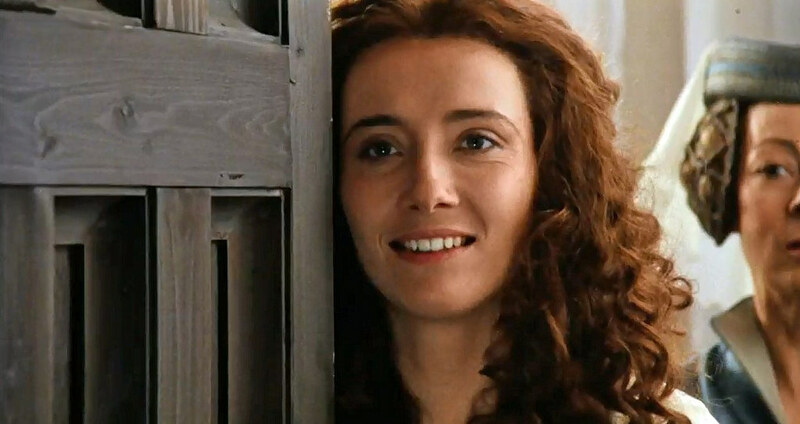 She drives the action, until he goes even farther than she is willing to go (when he has the Macduff family burned at the stake -- again, this movie shows how much children mean to these characters) and then her own guilt destroys her. I really love the two of them together, and when things fall apart, when they take that fateful, brutal step forward, they are engaging to watch, and they kept my interest throughout. I also like the sort of return to dignity Macbeth has at the very end, when he knows it's too late and it's all over for him. The supporting actors are good as well. David Thewlis as Duncan, Paddy Considine as Banquo, Elizabeth Debicki as Lady Macduff. I'm not as fond of Sean Harris's Macduff. I'm not sure what I want in the role, but his portrayal doesn't resonate for me the way I want Macduff to resonate. For me, he's the weak link in this film. This is an R-Rated movie for a reason, and the violence is bloody and brutal. This has been my entry for the We Love Shakespeare Week. Thanks to Hamlette for hosting! Set the date! 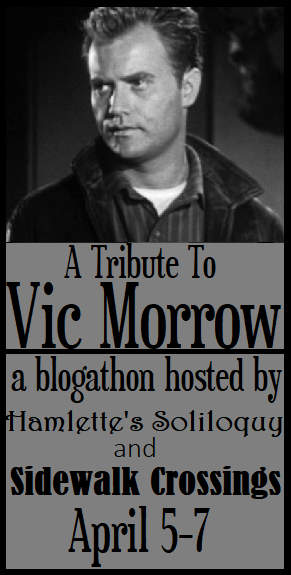 April 5-7, I will be co-hosting a blogathon with Hamlette dedicated to Vic Morrow. We invite you to join us. You can sign up here or over on Hamlette's blog, Hamlette's Soliloquy. Vic Morrow is one of my favorite actors. 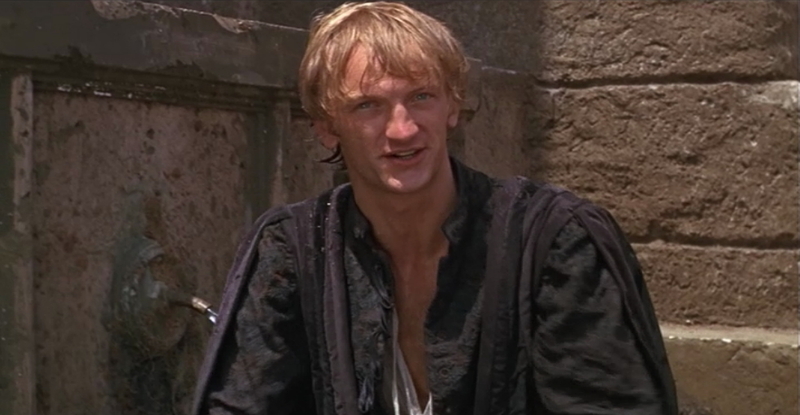 Discovering him in the television series Combat! was one of those moments of an entertainment title changing my life. I'd watched some Combat! back in college, but it wasn't until I was into my thirties before I had the opportunity to rewatch -- and I was completely hooked. The show holds up so well, the stories are so well written, well-acted by everyone involved -- but Vic Morrow... he was something else again. He did things above and beyond merely acting. He embodied the character of Sergeant Saunders in such a way that the character transcended mere television. I'm a mere spectator, watching these episodes on a television screen, and yet I feel his characters in a way I can't say I've felt with any other actor, even my other favorites. 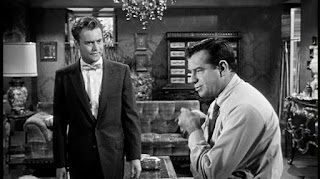 I know I've talked about this before on this blog somewhere, but watching Vic act taught me more about how to write a story than all my college classes combined. Vic Morrow and Combat! also brought me together with my best friend, Hamlette, and a bunch of other like-minded individuals I'm proud to call my squadmates. And I would never have the opportunity to visit Australia if not for Vic and this show. And Combat! is only one piece of his career. He made a lot of movies, guest-starred in a lot of television shows, and was a fine director. Some of the finest Combat! episodes are ones he directed. You are welcome to write a review of a single TV show episode for this blogathon, or review a movie, or write up anything else related to Vic Morrow that comes to mind. If you're not sure if your idea will work, just discuss it with either myself or Hamlette. Hamlette created a whole slew of buttons for this event. Find one you like and share it on your blog or website -- there are plenty to choose from! Hamlette's Soliloquy -- Why Vic's Character Sgt. Saunders on Combat! 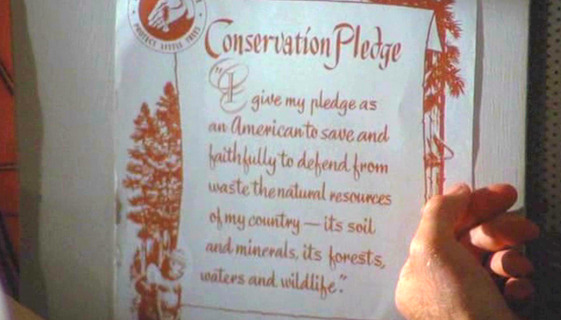 (1962-27) is My Favorite Fictional Character of All Time, and Why You Should, Like, Care. Also, a review of whatever movie of his I have that someone else doesn't claim. 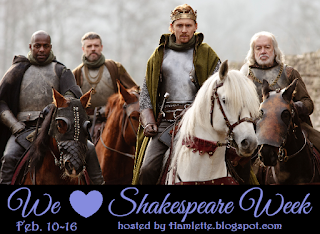 So, the We Love Shakespeare week is kicking off with a tag. Here are my answers. In 7th grade, when my school showed Franco Zeffirelli's Romeo & Juliet over two days on a huge screen in the school auditorium. I was completely engrossed, and I balled my eyes out for about a solid hour after the play ended. That particular version of Romeo & Juliet remains my favorite Shakespeare play to this day. Henry V, Iago, Mercutio, Hector, Banquo. Boatloads. I believe I may have actually seen more performed live than on film. I have definitely seen more variety of plays live. I had the privilege of attending the Oregon Shakespeare Festival in Ashland Oregon when I was in high school. My best friend's family took me along, and it was wonderful and amazing. We saw several plays there and that's where I first saw Troilus & Cressida and loved it. I also got to see two Shakespeare in the Park productions in NYC. Richard III with Denzel Washington was the highlight and one of my favorite live plays, though Taming the Shrew with Morgan Freeman and Tracey Ullman was right up there as well. And then, of course, there are the myriad movie versions of various plays I've seen. And opera versions, though these don't use the text, but Otello is one of my favorite operas, I prefer it to the play. 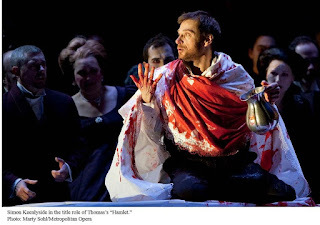 And it was watching Simon Keenlyside in the opera version of Macbeth that slowly made me appreciate that play. Many, though mostly because of high school and college courses. The first play I ever read was The Taming the Shrew, in a high school Shakespeare club run by one of the instructors, where we would meet at her house once a week and read a scene or two aloud, and she worked with us to both understand the words and how to speak them, and the history and social conventions of the time period. I read Bianca's role. 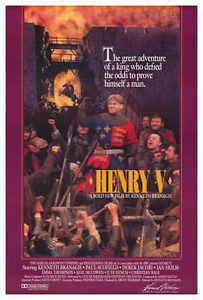 The only play I've read multiple times just for myself was Henry V. I fell in love with Ken Branagh's movie (saw it about 15 times when it came out in the theater), and I read it at least that many times after. I had most of the play memorized, the only Shakespeare play I can say that for (though I had Ken's abridged version memorized, not the full text). The Upon the King speech remains my favorite soliloquy of all the plays I'm familiar with. I'd like to see Othello with Idris Elba and Chadwick Boseman alternating in the title role, and Daniel Craig and Michael Fassbender alternating as Iago, so I can go enjoy both casts. I also wouldn't mind seeing an updated version of Hamlet set in some unnamed fictional Latin country, with Antonio Banderas as Claudius, Sofia Vergara as Gertrude, Oscar Isaac as Hamlet, Diego Luna as Horatio, Andy Garcia as the ghost of Hamlet's father, America Ferrara as Ophelia, Rodrigo Santoro as Laertes. Same thing that draws me to any story. I have to like the plot and characters. I have to want to be the characters, or at the very least relate strongly to them. I find it interesting that I don't like modern comedies, nor do Shakespeare comedies speak much to me either. I much prefer the tragedies and historical plays. I didn't realize it was supposed to be hard. Maybe because I've been reading/listening to Elizabethan English for nearly 40 years? Sure, if there were words I didn't understand, I'd look them up in the dictionary, but I have little problem understanding what is being said. Context and action tend to make it quite clear. You don't have to know the meaning of every single word to understand what characters are saying. I think it's a mistake to get hung up on language and it might even take away from the experience. (Here speaks the person who grew up watching operas in Italian or French, often with no subtitles, and could follow story and what they were saying based on limited knowledge of the language and context and action. So yeah, understanding every single word is not remotely a necessity to appreciating Shakespeare.) There's a beauty to listening to Shakespeare -- done well -- that goes far beyond the individual words. I'm only picking lines I can quote from memory and that I actually say to myself on a regular basis, so these are not going to be displayed in proper play format. They're also going to be mostly from Henry V as that is the play I know far and away the best. The last time I saw this movie was somewhere in the early 80s. It was the first and only time I saw the movie, though I had grown up with a couple cues off the soundtrack. Some movies I see once and I've forgotten them a couple weeks later. Some movies I see once and they stick with me for thirty plus years. 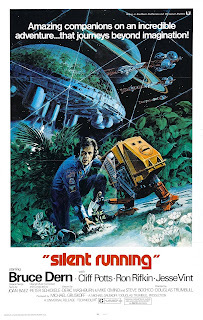 Silent Running is one of the latter. 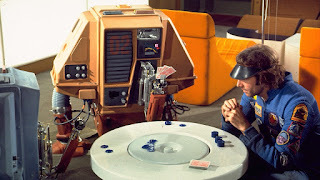 While Silent Running isn't one of my favorite movies, it's a movie I appreciate and I'm glad I rewatched it for the Robots in Film blogathon. 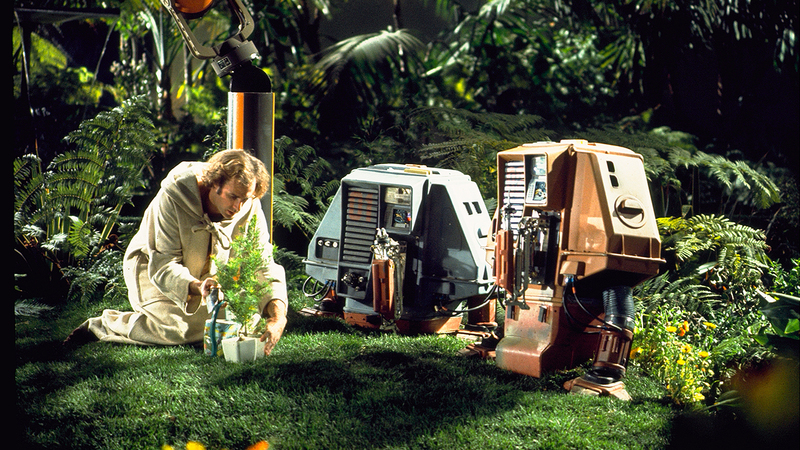 Rather like Wall-E, it's set in a future where nothing green grows on earth anymore. To preserve the last natural vegetation, several giant space freighters were sent into space, each carrying several greenhouse domes, each preserving a different type of natural environment. For eight years, the ships have been in orbit out near Saturn. Then the order comes from earth -- detach and nuke each dome and return home. They need the big spaceships for other purposes, and no one needs the forgotten forests anymore. 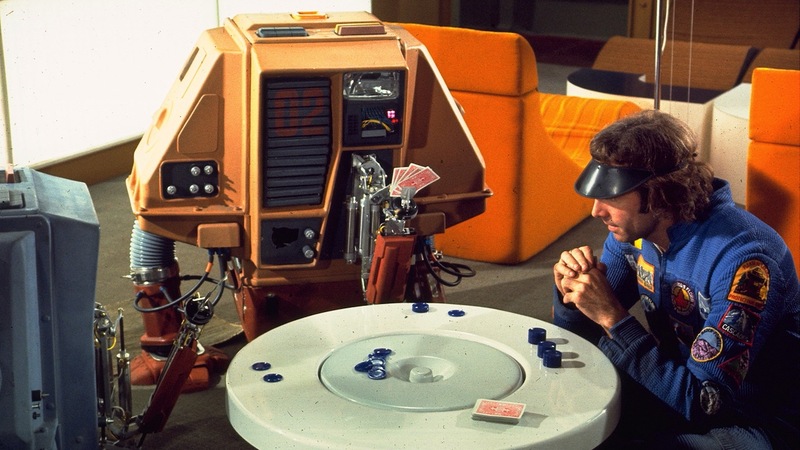 Our protagonist in this story is Lowell, played by Bruce Dern. He finally gets to play a good guy, though some could argue that Lowell comes a bit unhinged. And maybe he does. Your opinion may vary depending upon how much you love the natural world and how far you'd go to protect it. But I personally love Bruce Dern in this movie, and I love his character. I have to admit I relate pretty strongly to his passionate caretaker character, who ends up disobeying the nuke orders quite violently to save his favorite dome from destruction. Where the other crew members rotate on each year and take care of the running of the ship, Lowell has been with the ship caring for the domes the full eight years. Bruce Dern is perfect for this role. Watching his horror at the irreplaceable loss as the other ships gleefully jettison and blow up their own domes one by one is heartbreaking. By the time they come for his dome, you know he has to act. And that brings us to the robots in this movie: Drone 1, Drone 2, and Drone 3. Or as Lowell renames them: Dewey, Huey, and Louie, in that order. They are basically maintenance robots, designed to keep the giant spaceship running. But, they're also reprogrammable, and once he's alone on the giant ship, Lowell reprograms them to do all kinds of new stuff to help him survive. He programs them to perform surgery, to play poker, and, most importantly, to care for the garden. The robots are boxy, a bit awkward, have no mouths or eyes or any human features, but they quickly take on personalities after he reprograms them, and they appear to convey what they're feeling to some extent. They feel the loss of Louie, they consult each other during a poker match. It helps that Lowell talks to them as if they're human. Huey, Dewey, and Louie are crucial to the plot of this movie, and I love the ending of this film. The three robots are acted by real people, which accounts for their unique movements and the more human emotions they engender. The title of the movie does indeed come from submarine talk, as Lowell attempts to fake his ship's destruction to throw off the other ships and goes silent so he can escape with the last precious dome. When that ultimately fails, he's forced to take even more drastic measures to preserve the dome. This movie plays a bit dated now, the montages with the sung songs really jar by today's standards, but the effects, the cool design of the ships, the diverting go-kart-like vehicles, and robots are quite great. I watched the making of extra on the DVD, which I really enjoyed. This movie was made on a tight million dollar budget, as an experiment, in a quick 32 days. They filmed it on a decommissioned aircraft carrier, Valley Forge, redressing the carrier to look like a space ship instead of a naval vessel. It looks pretty fantastic, particularly the use of the giant aircraft hangar, which in the movie is a storage area and a homemade racetrack for their all terrain vehicles. (One of the memorable scenes I have never forgotten.) The spaceship in the movie is also called Valley Forge. The aircraft carrier gives the spaceship halls and rooms and control room a real feeling that I doubt constructed sets would have achieved. I have had a life-long attraction to botanical gardens. My favorite part of any county/state fair was always the garden area. Something about waterfalls and ponds and trees in an enclosed building always fascinated me. There was a Bank of America building in North Hollywood that we used to go to back in the 70's that had a mini botanical garden behind glass, with a waterfall and trees, and I was utterly entranced by it as a child. Best part of going banking with my mom was just getting to visit that little garden. I remember it to this day. So, I love the geodesic domes in this movie, each with its own set of trees, plants, water, animals... Right up my alley. 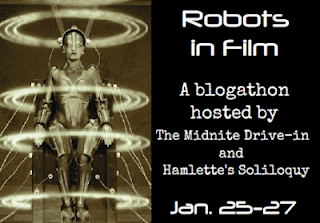 My thanks to Quiggy and Hamlette for hosting this Robots in Film blogathon! Check out the other entries to read more about other robots in movies! Wall-E is one of my favorite Pixar movies. It ties with Up for the number one spot, and I can’t choose between the two. What puts Wall-E up at the top of the list is not just the beautiful animation and the fantastic storytelling (done with almost no dialogue), but Wall-E himself. I am very fond of my action heroes, and a lot of grey area characters, and, admittedly, a lot of villains. Wall-E is none of those. Wall-E is the sweetest, gentlest, most romantic, naïve, generous, genuine, and most helpful character ever. He is probably the nicest fictional character I’ve ever loved. This is the magic of Wall-E.
Wall-E is one of the most amazingly wonderful characters ever created. The fact that he doesn’t really speak, that his character is conveyed strictly through his physical appearance and actions, just makes the beauty of his character even greater. It is the future. Earth has been evacuated and abandoned to mountains of trash and dust storms, but one lone little robot carries on with the job he was programmed to do: clean up the trash. Wall-E stands for Waste Allocation Load Lifter- Earth Class. He’s a little trash compactor. He trundles around, compacting trash into neat little cubes and stacking those into towers. One day, a spaceship arrives and drops off a probe, Eve (Extraterrestrial Vegetation Evaluator), designed to look for vegetation, and Wall-E’s life is changed forever. He falls in love with Eve (whose name he can’t pronounce, and he calls her Eva), and he follows her into space, to the giant starliner Axiom, one of the spaceships that humans have been living on for the last 700 years. The first half hour of the movie is my favorite. We follow Wall-E around as he does his job. He may be alone (except for his pet cockroach), but he finds beauty in everything. He marvels at a glimpse of the night sky, and films it on his internal recorder. When he stows away on the departing spaceship, the first thing he does in space is ooh and ahh over the view. When he locates where Eve is stored, the first thing he does is point out at the sky to share that beauty with her. He takes in all the sights in space with genuine awe at their beauty. Wall-E is also a collector. As he compacts trash on his daily rounds, he collects all manner of things that appeal to him. His home is full of his found treasures. His biggest treasure is a video tape of Hello Dolly, that he watches and re-watches in the evenings. He has an internal recorder, and he records the things he loves the most, like the clear night sky, and bits of Hello Dolly, particularly the part where two characters hold hands to express their love. Then Eve arrives. Where he is terrestrial and boxy and low tech, she is sleek and shiny and high tech, and she flies and soars with elegant grace. 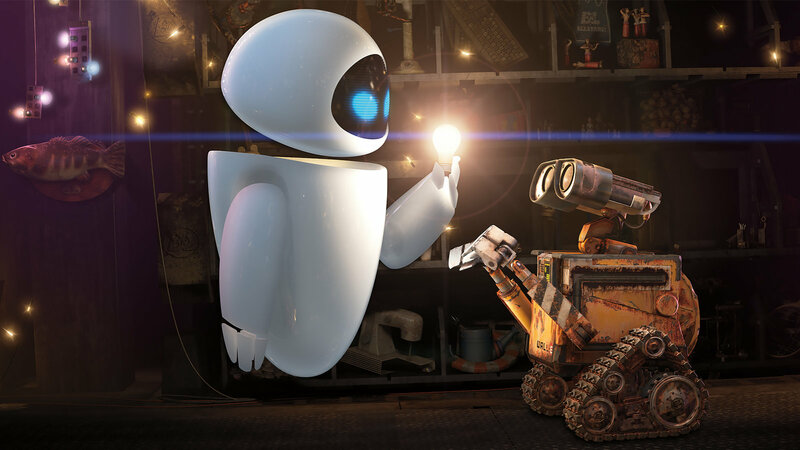 She is beautiful, and Wall-E falls in love just about instantly. He follows her around, makes her a statue (and is crushed when she rejects it), joyfully shows her all the treasures is his home, shows her his precious Hello Dolly video. He takes care of her when she shuts down, and, unwilling to lose her, he desperately follows her into space. All this is conveyed with almost no dialogue. 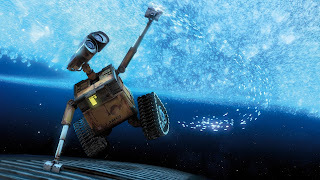 Wall-E says Eve’s name, but other than a couple words, he conveys everything he’s feeling with physicality. And his heart is worn right on his sleeve. Wall-E is one of the most expressive and heart felt characters I’ve ever seen. But as much as I love that first half hour, a lot of the Wall-E’s true strengths come out in the rest of the movie. Because Wall-E changes every single character he meets for the better, with the exception of the two bad guys, and for those, he serves as a catalyst to action. From Eve to M-O to the door-opener robot who learns to wave a greeting, to the two big Wall-A load lifters, to the host of damaged robots, to the captain, to John and Mary. Wall-E greets everyone he meets with warmth and compassion and wide-eyed-optimism and joy. Wall-E cannot even conceive of bad people. And each one who meets Wall-E discovers they can break out of their programmed lives and start really living again. And that is ultimately what this movie is about. It’s about living. Living your own life. Taking control of your own life. Following your dreams with joy and open hearts. Everything on the Axiom is run by robots. Even the literal paths the robots are allowed to traverse are designated lines on the floors. Until Wall-E shows them they don’t have to keep following a line in the ground. Wall-E doesn’t try to change anyone. He simply greets everyone with joy, offers open friendship to all, and points out the beauty and love in the world. That example is all that’s needed to open the eyes of those he meets. Even when Wall-E is grievously damaged, his first reaction when M-O approaches is to hold out his hand and introduce himself. He doesn’t ask for help, he simply says the equivalent of hello, happy to meet you. In the commentary on this film, the director, Andrew Stanton, says that the theme of the film was that irrational love can conquer life’s programming. The rest of the story was conceived in service of that theme, and was not meant to be messag-ey in any other way. As a writer, I understand that. 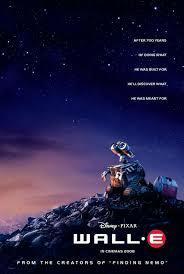 I talked with a lot of people when Wall-E first came out who found negative takeaways in this movie. Some got stuck on objecting to reading in an environmental message, etc., or they got hung up or offended by depiction of these futuristic people, but that misses out on the wonder and joy and happiness of watching a truly nice character change the world in his quest to find love, happiness, and meaning in life. This has been an entry for the Robots in Film blogathon. 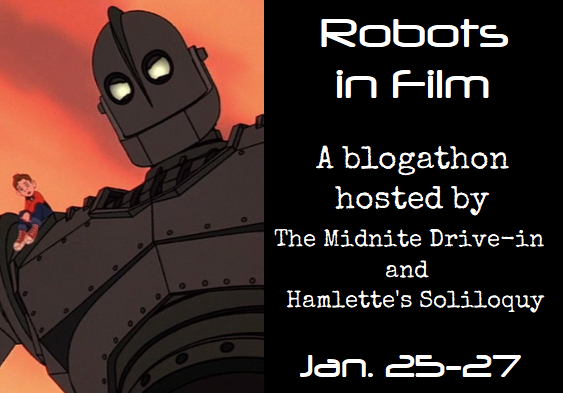 Follow the link to read the other entries in this blogathon. 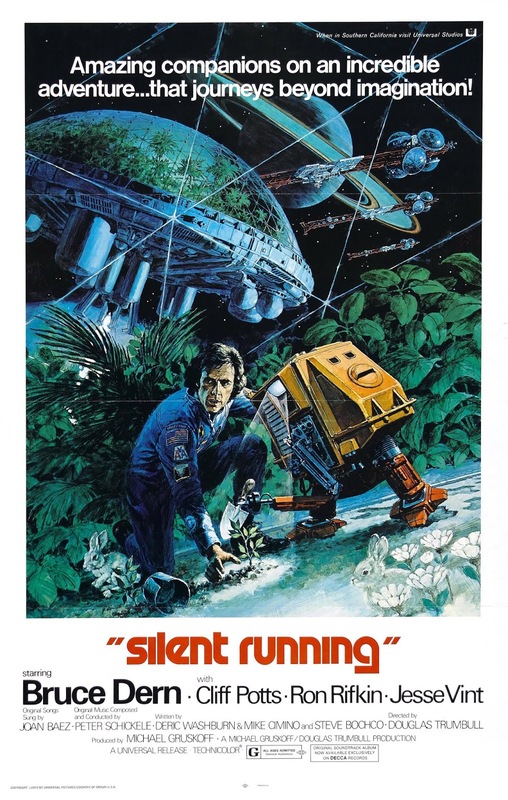 I will also be reviewing the 1971 film Silent Running. Naturally, since I made my list of favorite 2018 movies before the year was over, before the Christmas movies came out, my list changed before 2018 ended. Conclusion: it is really a three-way tie between Ready Player One, Avengers: Infinity War, and Bohemian Rhapsody. I honestly cannot pick one over the other. All three were seen multiple times in the theater, all of them leave me revved up and bouncy-happy coming out of the theater. I wouldn't change anything about any of them. All three were shared with family who loved them just as much as I did, so there are many memories, and hours of conversation about each of them. Music is infinitely important to what makes a movie a favorite movie, and the scores to all three have been listened to repeatedly. Obviously, the movies earlier in the year have been listened to more, but Bohemian Rhapsody, being Queen, kind of gets a pass there, as that is music I've listened to for even longer, though I've discovered some new songs. Which makes 2018 one fabulous year for movies for me. It is rare to have not one, not two, but three movies of that calibre, that captured my heart so completely. I was reviewing the movies I streamed on Amazon Prime and Netflix last year (which was a LOT), and oddly, I did not discover anything there that grabbed me. There was only one movie viewed from a streaming source that I wanted to own on DVD, and that was Macbeth (2015). 2018 was definitely a year for theatrical movies for me, not small screen. Merry Christmas and Happy Holidays! Hope it was a great one. I got to go see two movies at the theater this past weekend. 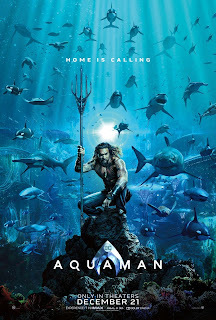 Aquaman (2018) - This was a very enjoyable movie. Pure popcorn fun. Definitely my favorite so far of the DC movies. I'm not much of a DC fan in general, but this one just really works well. I think a lot of that is because it doesn't have a message or agenda, and it doesn't try to be anything more than what it is: a superhero movie. And it does that really well. 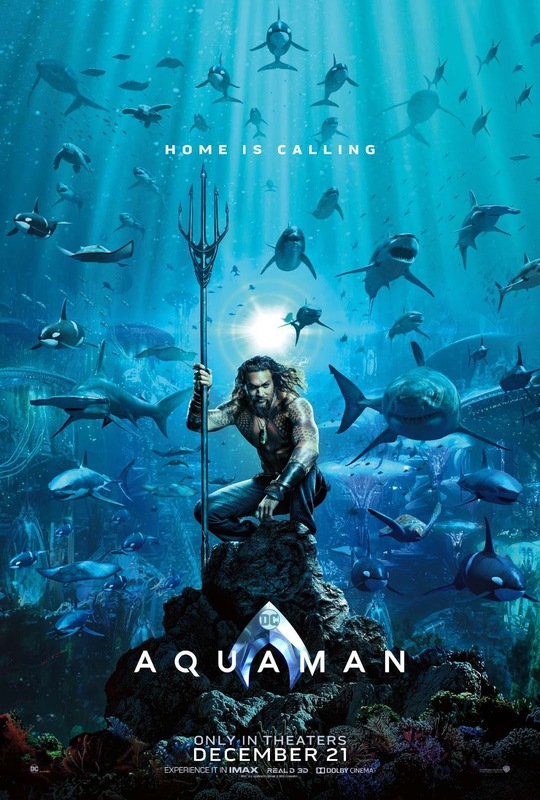 There is no great depth to this one, the plot doesn't try to be clever or manipulate its viewers, it's just straightforward and straight shooting. I liked the actors and the visuals were cool. There was a lot of humor, and some serious moments, and some striking imagery. There was a lot of beauty in the underwater landscapes that I appreciated. And a submarine. I'm always going to appreciate submarines. Alas, a completely unmemorable film score for this one, but otherwise, a very fun romp. Bohemian Rhapsody (2018) - I loved this movie so much. I can't wait to go back to see it in the theater again. I'm not even that much of a Queen fan, though I have always admired their talent, and I love many of their songs ("Crazy Little Thing Called Love" has been in the top 5 of my favorite non-Duran Duran rock songs for ages), but this movie is so classy and respectful and full of the band's love of creating music/performing. It's beautiful, it's sad, it sticks with you afterwards. This is movie celebrates their lives and their talent, it isn't a sordid expose. I like that. The casting is completely uncanny. The casting director should get an oscar for finding this ensemble cast who is freaking perfect. I was watching Queen videos the day after, and I literally cannot tell the real Brian May from the actor who played him in the movie. (My brother-in-law, who grew up watching and listening to Queen, commented that it was actually creepy how much of a resemblance there was... we're all fully onboard with the hilarious internet theory that Brian May (since he is an astrophysicist) figured out how to time travel and came to the future to make this movie. ROFL!) The others are truly amazing as well. Rami Malek is excellent as Freddie Mercury, and he really looks like him, particularly with short hair and a mustache. Of course, I've been listening to Queen songs and watching their videos ever since seeing the movie. I'm still trying to decide if I want to go see Mary Poppins Returns. I've been hearing good things about it... but I just don't know if it's for me. Tried every different template style in here and came back to the one I had originally. How come they don't have any other dark ones?